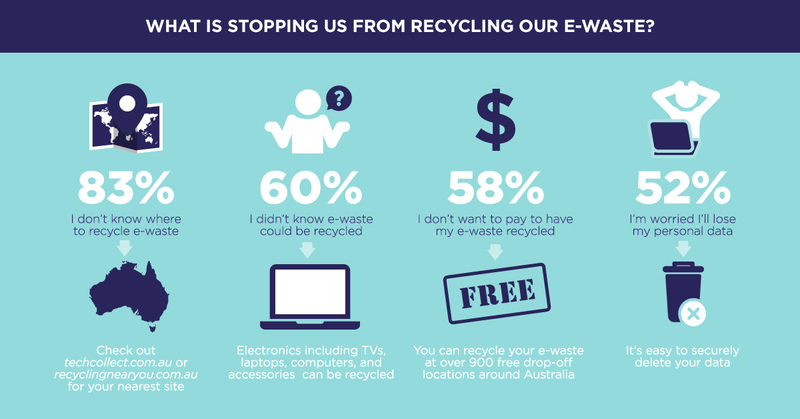 TechCollect recently commissioned research which surveyed Australians’ e-waste recycling knowledge and behaviour. We are calling for Australians to consider the environmental impact of not recycling their e-waste as new research reveals almost half of us are holding onto unused or broken electronic devices in case we need them again one day (43%). The research highlights 1 in 5 (22%) of survey respondents admit to being hoarders of old electronic devices. When asked why they don’t recycle their e-waste, 52% said they are worried they’ll lose personal data. Other reasons include not knowing where to recycle e-waste (83%), not knowing it could be recycled (60%), and not wanting to pay to have their device properly recycled (58%). All Australians need to take an active role in being responsible for recycling the e-waste they are generating. The challenge is encouraging consumers to let go of old devices they are no longer using or which are actually broken beyond repair. Although devices can hold sentimental value, the non-renewable resources in them can be used in manufacturing when recycled correctly. Our new research tells us the average Australian household has approximately 17 electronic devices in the home and yet only 23% of us are always recycling them. With the consumption of electronic devices getting higher all the time, it’s crucial consumers look at e-waste recycling as the natural next step in the product lifecycle, especially when it no longer serves its purpose to them. When asking respondents what they do with their unused electronic devices, only 33% admitted to actually recycling it at a designated drop-off site. Other responses included putting their e-waste on the nature strip for a scheduled council collection (28%) and throwing it in the garbage bin (25%), which means the product is almost certain to go straight to landfill. What is concerning in the research is 53% of respondents don’t know they can take their e-waste to an e-waste collection site to avoid it going to landfill, and 63% don’t know if their local council recycles e-waste. These figures are definitely worrying to us. As the end users of these products, it’s important the public is informed on the important role they play in responsible e-waste recycling. Taking e-waste to a designated drop-off site ensures materials that can be harmful to both people and the environment if put in landfill, are correctly recovered or disposed of. Unfortunately, people who are putting the product on the kerbside or in the bin may feel they’re doing the right thing, but this doesn’t guarantee the product won’t still end up in landfill. The survey explored respondents’ feelings of responsibility and guilt. For those who choose to recycle their e-waste, 74% do so because they feel responsible for the e-waste they produce. When respondents were questioned on how those who don’t recycle their e-waste feel, 18% said they feel very guilty and 46% say they know they could be doing more to help. Apathy is a problem too, with the research showing 31% don’t really think about it. Other findings showed 69% are aware that dumping e-waste in landfill can be hazardous to the environment and 60% of respondents know their electronic devices contain valuable resources that can be recovered. These findings are promising. They tell us most people feel responsible for the e-waste they produce and do feel an element of guilt when they choose not to recycle it. But the sad reality is many people just don’t know what to do with their e-waste. It’s why TechCollect is keen to inform people about the importance of recovering the resources we already have in products that can be re-used, ensuring they understand the process of recycling their e-waste, and where they can dispose of it. 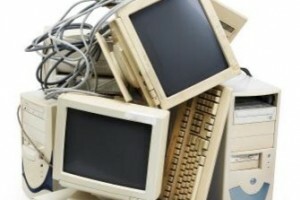 Take a look around your house/office for old, unused electronics. Wipe data, say goodbye, perform any farewell ceremonies. Find out what we take here. Find your nearest TechCollect site here. Drop off your unwanted e-waste for free. Feel good that you did something positive for the planet. Enjoy your new, de-cluttered life.